Enlu Zhou will join the Department of Industrial & Enterprise Systems Engineering (IESE) at the University of Illinois at Urbana-Champaign, as an Assistant Professor in the coming fall. Enlu Zhou received a B.S. degree with highest honors in electrical engineering from Zhejiang University, China, in 2004, and is expected to receive a Ph.D. degree in electrical engineering from the University of Maryland, College Park, in 2009. 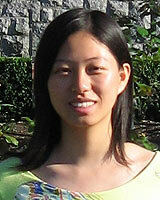 She is advised by Professor Steve Marcus (ECE/ISR) and Professor Michael Fu (BUS/ECE/ISR). She is a recipient of the NSF award for Cyberinfrastructure Experiences for Graduate Students in 2007, the Future Faculty Fellowship from A. James Clark School of Engineering in 2007-2009, and the ECE Distinguished Dissertation Fellowship in 2009. Her research interests include decision making under uncertainty and/or partial observation, optimization, simulation, and control theory, with applications in supply chain management and financial engineering.